OK so I enjoyed it, but it still has problems and I'm still confused about things. One of the main problems I have is the Church of Night worships The Dark Lord and there's the whole play they put on about how Lucifer is really the good guy. Yet Sabrina doesn't want to be Hell's Herald. WHY? I mean she's embracing her witch side and then they find the prophetic mosaic and she suddenly totally changes gears. Just because it might have been foretold? It just didn't work for me as a reason for the huge 180. Another small point. After recovering from falling down the stairs, Billy (I think it's Billy) apologizes to Theo. But while the apology seems genuine, he does make a point of saying he was sick of accidents happening to him. So he apologies to Theo out of fear for his well being, which isn't a great solution to the bullying issue. Terrify your bully into respecting you is not a good message. And it certainly won't ensure that Billy won't bully other people in the future. On the other hand, I love Michelle Gomez and all the other little cameos. The hat tip to Bodysnatcher's the Mandrake episode was great. It seems like it's going in a very Buffy direction-the nexxus, the doppledangers, the bf sent to hell to save the world. They even have a very neo scoobs like group. Yet Sabrina doesn't want to be Hell's Herald. WHY? I mean she's embracing her witch side and then they find the prophetic mosaic and she suddenly totally changes gears. Just because it might have been foretold? It just didn't work for me as a reason for the huge 180. My interpretation of this is that when she first got these super powers, she felt like this was a chance to do good. After all, a lot of Sabrina's internal and external conflicts have centered on this dichotomy between her or witch vs mortal sides and the path of good vs evil. So it seems like at first she though these powers were a way to go in the good direction. She used it to heal and resurrect people and to stop those evil angels. Then, she hears this prophecy, and she finds out her powers are intended for her to bring hell to earth, which is why she immediately tries to get rid of them. Despite some quibbles here and there, I overall enjoyed these season 2/season 1 part 2 episodes. 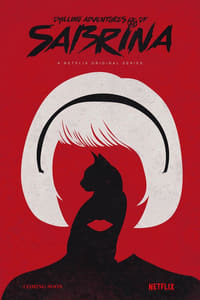 I definitely find the magic side of thing much more interesting than the mortal stuff, so having the show shift its focus more on Sabrina's interactions in the magic world improved things for me. Although I was really rooting for Dorian and Ambrose to hook up, and I totally thought that is where this was heading when Dorian agreed to help hide Ambrose. Oh well, maybe next season. I do dread the inevitable return of the Harvey/Sabrina romance. Harvey is just so aggressively boring as a character. I had similar problems to miss-lapin. There's a contradiction at the very center of the series, that they want the main characters to be good people while also wanting them to be evil people. The problem was present but ignorable in season 1 as they show one side or another of that contradiction at a time, but the problem looms steadily larger and becomes steadily more difficult to ignore through season 2. Like, she knows that Satan and hell are genuinely evil and she wants no part of it. And she's not into cruelty or decadence or anything like that and really tries to be a good person 90% of the time. And she literally knows that there is an honest-to-God Christian God and angels and the whole she-bang. So why is she still defending the witch world? I feel like given her character and her knowledge of the world she should be trying to convert all her friends to Catholicism, since otherwise she knows for a certainty that they will be eternally tortured after death. satan likes it, and if he wants it different he'll tell you." I still like it all a lot, but I agree with the criticisms, more or less. I think it all works better when Hell and Satan are somewhat ineffable concepts that are subject to interpretation, and misinterpretation. When Satan is this sketchy dilfy PUA and Hell is a place that you certainly wouldn't want to go to but does really exist, like Florida, it becomes a different and less interesting show. Maybe Sabrina sees both sides as corrupt? The devil and the church of night are awful, but god and the Christian Church seem similarly abusive. If this is primarily a women’s empowerment story, the Catholics are literally no better than the satanists.
" If this is primarily a women’s empowerment story, the Catholics are literally no better than the satanists." I feel like the show is trying to make a point of these things. When they talk about women not having a place of leadership in the church, the first thing that springs to my mind is parallels with the Catholic church. This occurs throughout the series, and I don't think it's just my imagination drawing this parallels. I said this in one of the other threads about CAoS, but I think the show is basically about witchcraft as imagined by someone who went to like 30 years of Catholic school, and I agree that the Church of Night is more a metaphor for the Catholic Church than it is even a parody of it. Enjoyed it, kinda, but ultimately disappointed with it. I know the show never had any real pretense at being anything deep. But feels like they blew an opportunity. Lucifer, and the church surrounding, could have been so much more. Something intricate. Weaving the myths of baby-eating Satan with the myths of Lucifer the liberator. Ultimately, chaotic neutral-leaning-towards-good. The sort of thing which would logically allow the witches the room to be kind & altruistic (even to mortals), but also willing to participate in the occasional human sacrifice or cannibalistic feast. That's how they were portrayed. Would have been nice to give that characterization a good underpinning. With Father Blackwood as the corrupting element. Pulling the faith towards Lawful Evil: dogma, rules, sexism. Something that would more resemble Heaven in its legalistic and rigid form. With Blackwood being more Satan than Satan, and thus ultimately a heretic. All this while keeping Lucifer relatively undefined. Which gives the tension of witches on either side the ability to claim Satan was on their side. And never gives the audience a complete answer as to who or what Lucifer was, which preserves quite a bit of the mysterious, mystical and creepy elements. I was hoping for that route because much of the season(s) was seemingly going that way. But, alas. To me, the show became far less fun once Satan was just another Big Bad. A slimy, shallow Big Bad at that. And she literally knows that there is an honest-to-God Christian God and angels and the whole she-bang. The show doesn't really delve into theodicy, but I can see a "God is Also Bad!" resolution. If there is any kind of supreme being, I told myself, it is up to all of us to become his moral superior. I dunno about the theological trappings, but I'm pretty sure the Addams family exists in the same universe as this show, and Zelda probably moves in the same social circles as Morticia. Was it just me, or did the actor who plays the dark lord look a bit like Chris Barrie? I was going to watch this season/part slowly but ended up binging the last 4 episodes last night because I just had to know how it ends. I don't really see the contradictions that have been pointed out here. Sabrina, and the witches themselves, have been raised to praise Satan and to do his bidding, but as Zelda herself pointed out, nowhere in the bible does it talk about Satan coming to Earth, bringing demons from Hell with him, and subjugate all life on Earth. As soon as they realize the Apocalypse was prophesied and is coming true, they rushed to stop the Dark Lord. Sure they shouldn't have been so surprised because he's the Master of Deceit, but they thought they would be fine since part of what Satan preach is personal freedom. The hypocrisy is that the church itself have strict rules and codes, but that's more to do with the patriarchy of the Council rather than anything Satan himself have stated. In fact, when he's scolding Blackwood, he doesn't seem to care about what Blackwood have done, as long as he's willing to bow down to Sabrina. Satan could care less how the churches are run, as long as everyone is obeying him and whoever his queen is. I do enjoy the show more with its theme of female empowerment. It's really evident in Prudence and Zelda choosing to stand up to Blackwood, and Lilith standing up to Satan to take the crown for herself. Some of it was hamfisted in the way the plot plays out, but it adheres to the campiness of the show, so it's fine, I don't expect subtlety from this show. And it allows the scene chewing from Blackwood's and Prudence's and Lilith's actors (and even Theo's) to shine through which was entertaining. The magic stuff was done well too, little as it was. My biggest complaint is the scale of it all seems off. Aside from the angel witch hunters, there doesn't seem to be much of a world-building outside of Greendale. I couldn't help but compare this apocalypse to the one from Supernatural, and that show really lets you know that the crazy stuff the main characters are experiencing also affects the overall world as a whole.